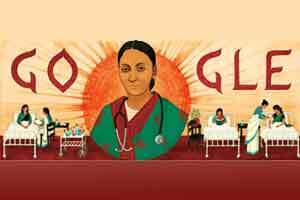 NEW DELHI: Search engine giant Google dedicated its doodle to Rukhmabai Raut, one of India’s first practicing doctors, to celebrate her 153rd birthday. However, Dadaji did not support Rukhmabai’s choice to continue studying, which led her to take the decision of not remaining married to Dadaji. In 1884, Dadaji filed a petition at the Bombay High Court to restore conjugal rights over his wife. The court, in its judgment, directed Rukhmabai to live with her husband or go to the jail. Rukhmabai, however, refused and told the Court that she would prefer to go to jail, rather than staying with Dadaji. It was only in this case that the Age of Consent Act was passed in 1891, which outlawed child marriages across the British Empire. The court ordered the Rukmani to either stay with her husband or face imprisonment and go to jail. She fulfilled her dream of becoming a doctor through the support of stalwart Dr Edith Pechey, the British director of Bombay’s Cama Hospital, Rukhmabai was able to procure her degree in medicine from the London School of Medicine For Women. She even started providing medical aid to women in India through support from Eva McLaren, Walter McLaren and the Countess of Dufferin’s Fund. After studying from 1889-1894, she returned to India in 1894 and joined a hospital in Surat, where she served as the chief medical officer for 35 years. She retired around 1930. Rukhmabai, who was also an active social reformer, breathed her last at the age of 91, on September 25, 1991. Remarkable grit and determination -we salute to her ! It should be from 1889-1894 not 1989-1894.